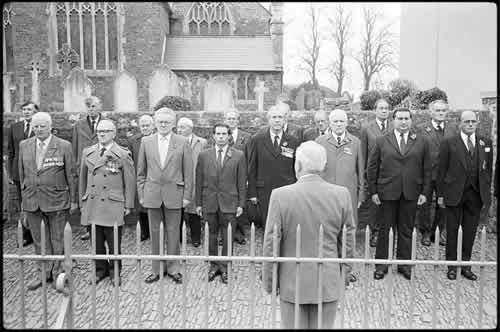 Chumleigh Church Parade for Remembrance Day 1987. 266227 Lance Corporal Arthur Henry Beer of the 1st/4th Battalion , the Devonshire Regiment. Son of John and Sophia Beer of the Mills, Beaford. Born in 1896. Died 22 April 1917 aged 21 in India. M2/201186 Private Herbert John Cannon of the Royal Army Supply Corps (Motor Transport Division). Son of Luke and Fanny Cannon; husband of Florence Cannon of Torrington. Born in Bristol in the registration district of Mere in 1881. Died 9 November 1918 aged 37 in Serbia. 118382 Pioneer Albert Down of the 7th Labour Battalion, the Royal Engineers. Husband of Florence Cannon of Lane End Cottage, Beaford. Born in South Molton in the September Quarter of 1874. Died of wounds at home 29 December 1916 aged 42. Buried in Beaford Churchyard.